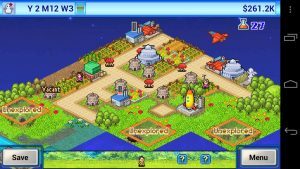 Epic Astro Story is another Kairosoft game: games which kind of exist in a hybrid genre all of their own: strategy adventure SIM RPGs might be one way to describe them. Interestingly despite Dungeon Village having a classically RPG them, Epic Astro Story feels like more of an RPG, mainly because you can choose what residents will serve on each mission and fight, and whether they should be melee or ranged, and what skills they should have, and even position them on different rows if you want to. Once combat starts it’s auto – it feels very like Tapquest – and is quite quick. Essentially you explore a planet section by section, building fields, mines and factories for your residents to work in, as well as hotels and launchpads for visiting alien tourists. The way the little rockets and spaceships arrive, hover and land, dropping off their passengers, is really lovely. The graphics are unashamedly retro but the game manages to be really atmospheric. Missions include visiting alien planets, where you can pick up more residents, clearing caves, and exploring new sections. The planets are replayable, though there may not be much to gain in terms of mission cost vs recoverables. Gradually you earn cash and develop technologies and better weapons and armour, and pay to level up your residents. There are no experience points, but those serving on a mission may get a stat boost encounter. Epic Astro Story should give you a good number of hours gameplay for your money, and it’s relatively replayable as unless you read up on the hints and tips guides, you’re unlikely to clear the game the first time through (though it lets you keep playing, just not adding to your high score). There is a Lite version which allows you to play for two years of gameplay for free. However it doesn’t seem as though you can transfer your Lite planet to the Full version if you do go on to buy it, but it won’t take long to get back to where you were.